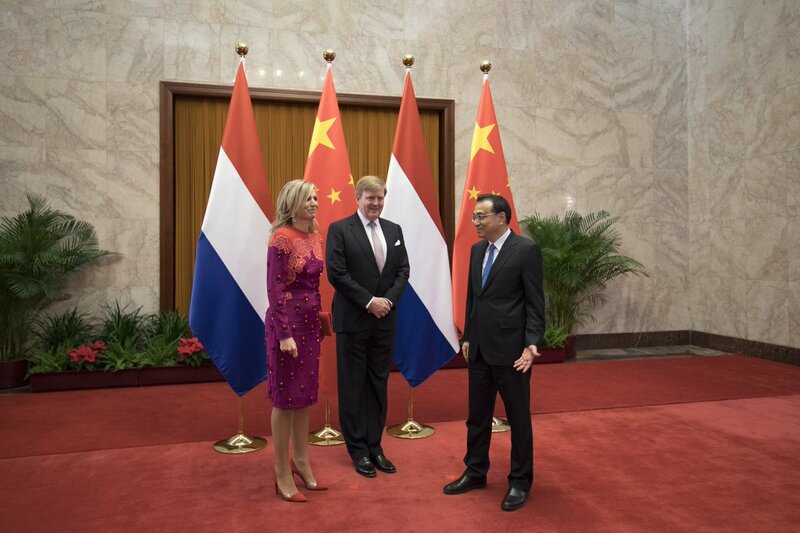 His Majesty King Willem-Alexander and Her Majesty Queen Máxima, on invitation of President Xi Jinping of the People's Republic of China on 7 February 2018, paid a working visit to China. On 8 February, Her Majesty Queen Máxima will take part in an economic program in Beijing. They are accompanied by Foreign Minister Zijlstra, who in addition to the program with the Royal Couple also has a conversation with the Chinese Foreign Minister Wang Yi. The King and Queen are greeted at the Beijing airport by a Deputy Minister of Foreign Affairs. They will then be briefed at the residence of the Dutch ambassador by a number of experts on Chinese politics, the economy and the Belt & Road Initiative. The initiative is a modern variant of the Silk Road and focuses on the promotion of trade and economic integration between the participating countries. To this end, China invests in roads, pipelines, ports, communication networks and other infrastructure that promote cooperation. At the end of the afternoon, the Royal Couple is welcomed by Chinese Prime Minister Li Keqiang. Then they meet President Xi Jinping and his wife, Mrs. Peng Liyuan, and follow a delegation meeting. The working visit ends with a dinner with the president and his wife. China is an important 'new' global player on global issues such as climate change and is the second largest economy in the world. The Netherlands is China's third largest EU trading partner. 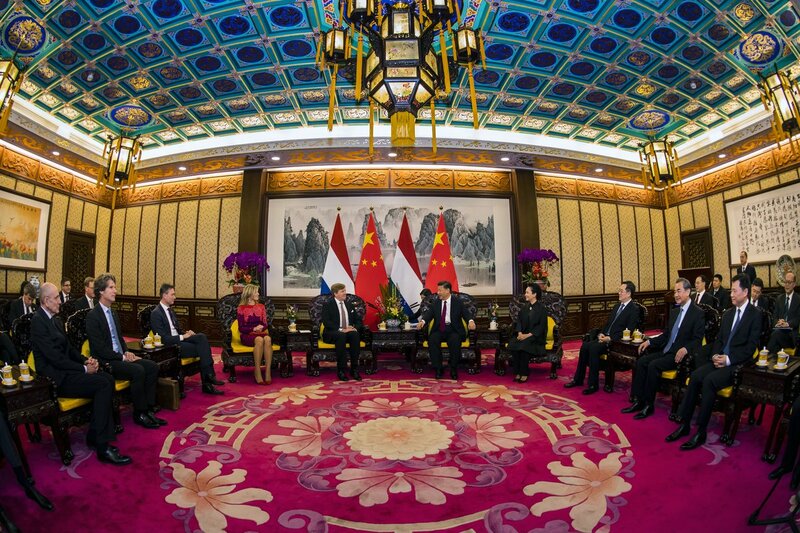 The Netherlands and China are both dependent on a well-functioning world trade in which frequent contact and cooperation are necessary. The working visit builds on the good relations that have been built up during the mutual state visits in 2014 and 2015. Maintaining good relations with China contributes to the quality of bilateral cooperation at all levels. King Willem-Alexander leaves on February 8 to Pyeongchang in South Korea in connection with the Winter Olympics. Queen Máxima starts the second day of her visit by attending a roundtable discussion on Green Finance . During the roundtable discussion, Dutch and Chinese stakeholders talk about the cooperation between the Netherlands and China in the area of Green Finance , in which economic growth goes hand in hand with reducing CO2, reducing waste flows and making better use of natural resources. In addition to companies in the field of clean technology, Dutch banks and pension funds are also active in China with green financing concepts and in the development of standards. After the round table, Queen Máxima visits a meeting of the Dutch and Chinese business community. During this meeting, Dutch and Chinese entrepreneurs meet to learn from each other and to strengthen mutual relationships. Finally, she visits a Dutch-Chinese architectural firm based in a former state printing company. After a tour she will discuss with Chinese architects about sustainable urban development and water management in the cities in relation to climate change. TM have left for Beijing today. King Willem-Alexander and Queen Maxima arrrive at the Netherlands embassy in Beijing on February 7. Apparently the dinner of yesterday evening lasted 1 1/2 hours more than planned. A good sign, according to the newspaper . They also said that the Chinese press noted there were a lot of European visitors lately: PM Theresa May was in China only last week while President Macron visited China 4 weeks ago. Unlike the British PM, the Dutch delegation did claim to have raised the topic of human rights. The Netherlands is the 2nd largest foreign investor in China (after Germany). Their Excellencies & Their Majeties in the Chinadaily.